Historic Marker on Monticello Avenue. Similar to others on Fontaine and the 250 Bypass. William Taylor was a Scotsman who received a patent from the British Crown for 1,200 acres in what is now downtown Charlottesville in 1737. Colonial Richard Randolph of Henrico later acquired 1,000 acres of land, which is now believed to be Taylor's, and conveyed it in trust to Dr. Thomas Walker in 1762 to be sold to Albemarle County to establish a courthouse and county seat. One year later in 1763, Walker sold the first town lots for the average price of one acre per pound sterling. 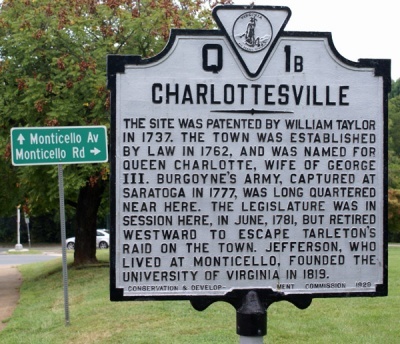 The county selected Charlottesville as the new county seat because it was "the center of the population of the county" as opposed to then county seat Scottsville . There has been some controversy surrounding who owned the land that is now downtown Charlottesville. The Magazine of Albemarle County History wrote in 1947 that "it is not possible to determine definitely from whom Col. Randolph had obtained this land, but it must have been from either Nicholas Lewis or William Taylor, both of whom owned land in the immediate vicinity of Charlottesville." However, the Magazine would go on to conclude that "it would seem that this tract of Taylor's more nearly approximated the location of the town than did that of Lewis" considering the adjacent land owners to downtown Charlottesville after its establishment in 1762 were the same as that of Taylor's land in the years prior. Furthermore, there is no record of what happened to the rest of Taylor's land while Lewis would later transfer a large portion of his tract to his daughter, supporting the claim that downtown Charlottesville stands on Taylor's former property.. Beyond the 1737 patent, Taylor sparsely appears in local histories. The only additional appearance of a William Taylor in local deed books records the sale in 1768 of 30 acres in North Garden. Taylor is described in that document as a planter in that still-rural area. Taylor's great-great-grandson Jefferson C. Randolph Taylor at one time owned the Lego property, which was established by Thomas Jefferson as one of his original "quarter farms" along with Tufton and Monticello. William Taylor Plaza is a proposed development named for Taylor on Ridge Street and Cherry Avenue. ↑ 1.0 1.1 Guest Editorial: Ridge-Cherry’s non-mystery history, Antoinette W. Roades, The Schilling Show Blog, 3 Sep 2009 retrieved 13 Sep 2009. ↑ Virginia Historic Marker Q-1B. 10 Sept. 2009. Raw data. Monticello Avenue, Charlottesville, VA.
↑ Albemarle County in Virginia. Rev. Edgar Woods. Originally published in 1900. Republished in 1964 by C.J. Carrier Company. Pages 6, 302. ↑ 5.0 5.1 A Sociological Study of the Privileged Groups of Albemarle County, The City of Charlottesville, and The University of Virginia. Hilda Price Jarvis. A thesis presented to the faculty of The University of Virginia in 1935 for Masters of Science. ↑ 6.0 6.1 6.2 Papers of the Albemarle County Historical Society. The Magazine of Albemarle County History. Volume VIII 1947-1948. ↑ Historic Homes of the Southwest Mountains of Virginia. Edward C. Mead. Copyright 1898 J.B. Lippincott Co. Published in 1978 by C.J. Carrier Company. ↑ Lego, Thomas Jefferson Encyclopedia, reference to Thomas Jefferson’s Monticello, Thomas Jefferson Foundation, Inc. (Chapel Hill: The University of North Carolina Press, 2002), 169. This page was last edited on 18 September 2009, at 18:18.